Printers available in the market are relatively inexpensive, but their operational costs are very high. This makes all kinds of printing expensive. Today, marketing has become very important for all kinds of businesses. Firms are always on the lookout for ways on saving money on printing promotional material like banners, brochures, flyers and the like. Below are a few good tips on saving money on your daily printing needs. You do not need to waste your money on buying expensive branded print cartridges. Many re-manufactured cartridges, which are available in the market are inexpensive and last longer in comparison to branded cartridges. Even though using unbranded ink will deteriorate the quality of your print, it is very efficient for daily use and will save you a lot of money. The top printing services charge exorbitant prices from their clients. If you really want to save money on wholesale printing costs, try other suppliers that are not very popular. They will definitely give you good service and will also charge you a lot less than their top-notch competitors. Using offset printing to print brochures, flyers and other promotional material will allow you to save significant amounts of money. Offset printing prints material very quickly and in bulk amounts. This will help you save money when you need to get more than five hundred brochures printed. If you need to have banners printed at low cost, plan your printing in advance. Many printing services charge higher prices for urgent orders. You can also choose lightweight fabric to reduce further cost on printing your banner. If you search online, you can find many printing services that provide different types of promotions on their services. These can include attractive discounts, money off on printing a set number of prints or more, and some also provide free shipping. The most cost-effective way of printing your promotional material is to use your office printer. If color printing is not necessary, then print all pages in black and use both sides of a paper using the Draft Mode. This will definitely save you money as compared to getting your prints done from printing shops. 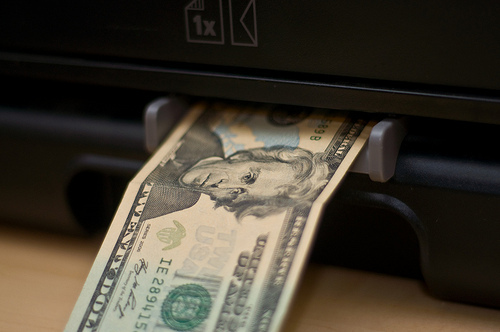 These tips will definitely help you save money on your printing costs. Tim works for a company specialising in promotional pens. Tim has a great experience with printing processes and has helped numerous business on save money with printing.